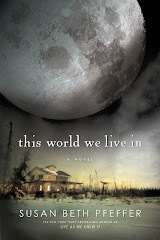 I finished reading Susan Beth Pfeffer’s THIS WORLD WE LIVE IN tonight. Now I am in no mood to sleep and will likely be awake in bed plotting ways to store canned goods in my basement. I should know by now not to read post-apocalyptic fiction on school nights, but no…I’m a sucker for a great story. And this one is. If you enjoyed the first two books in this series, LIFE AS WE KNEW IT and THE DEAD AND THE GONE, you’ll also love this latest (and final) installment. Set in a world turned upside down almost a year after an asteroid has hit the moon, upsetting everything from weather patterns to the tides, this book is dark, to be sure. But it’s not without its moments of hope and beauty. Reminiscent of Cormac McCarthy’s THE ROAD, it’s the story of those who remain…including some familiar characters from the first two books. It’s tough to say more without being spoilery, and I most definitely don’t want to do that; fans of Pfeffer have been waiting for this one, and they won’t be disappointed. Reviewed from an ARC from ALA midwinter and due out in April 2010. This entry was posted in Uncategorized and tagged susan beth pfeffer, this world we live in. Bookmark the permalink. Both comments and trackbacks are currently closed.